Rangers and state police fight fierce winds and dangerous cold to find woman and her young sons. Forest rangers and state police rescued a mother and her two preteen sons near the summit of Mount Marcy in mid- March after undertaking, in brutally cold conditions, one of the largest search operations of recent years. “As far as our urgency chart, this was way up there. We had many, many red flags popping up,” said Forest Ranger Captain John Streiff, who oversees rangers in Region 5 of the state Department of Environmental Conservation. Potsdam resident Ningyun Cai and her two sons, ages seven and eleven, became lost in blustery conditions above tree line on the afternoon of Saturday, March 21. Realizing she was disoriented, Cai called Essex County 911 on a cell phone at 5:30 p.m., initiating a search that would include twenty-six forest rangers, four environmental conservation officers, a state police special operations team, state police supervisory staff, and a state police helicopter. Following an overnight search, the helicopter pilot spotted Cai and the children on the south slope of Marcy late Sunday morning. Rescuers airlifted the children to Adirondack Medical Center in Lake Placid, where they were treated for cold-related injuries before being transported to the University of Vermont Medical Center in Burlington. The mother was flown to Adirondack Medical Center in Saranac Lake, where she was treated and released the same day. The children were hospitalized for at least several days. The story of the heroic rescue was publicized around the country, but except for a brief email to the Associated Press, Cai did not respond to media questions or interview requests. A few days after the ordeal, Cai and her husband, Robert Snyder, posted an online message thanking the rescuers and requesting the media to respect their privacy. They provided no details about the severity of their sons’ injuries. The following account of the rescue operation is drawn from interviews with DEC personnel, state police, and others. Ranger Kris Kostoss talked to Cai by phone after she reported that she was lost. An adjunct professor of biology at the Potsdam State College, Cai said they became lost on the way down after reaching the summit at 4 p.m. She told Kostoss they had descended the northeast side of the mountain, the same way they had come up, but that’s not where they were found. Cai had a map but no compass or GPS device when she got lost. Upon reaching tree line, she had removed her day pack, which contained a compass and heavy jackets. The group also left snowboards at tree line. They had stashed overnight gear, including sleeping pads and sleeping bags, in a lean-to at Marcy Dam. Kostoss said leaving the compass behind was a mistake as it could have helped Cai find the way back to the trail. He also said it would have been prudent to turn around before reaching the summit if the weather was bad. One hiker told the Explorer the summit was engulfed in fog and it was snowing when she and her companions reached the top of Marcy a little after 2 p.m.—roughly two hours before Cai and her children. The hiker, who wished to remain anonymous, said she passed the family at Marcy Plateau on her way down. Evidently, the thirty-nine-year-old Cai, a native of China, was not a novice hiker. A photo on the Potsdam State College website showed her shouldering a huge backpack. She and her husband, an assistant professor at Potsdam, had led students on trips in China to study biodiversity, according to the website. Kostoss said Cai and her sons were properly dressed for cold weather and wore snowshoes. They also carried avalanche equipment, including locater beacons, shovels, and probes. “From talking with her, I could tell she was experienced and she knew what she was talking about,” Kostoss said. Kostoss was part of the first wave of forest rangers who searched for the family. He, Robert Praczkajlo, and Dave Russell left South Meadow Road on snowmobiles at about 7:30 p.m. 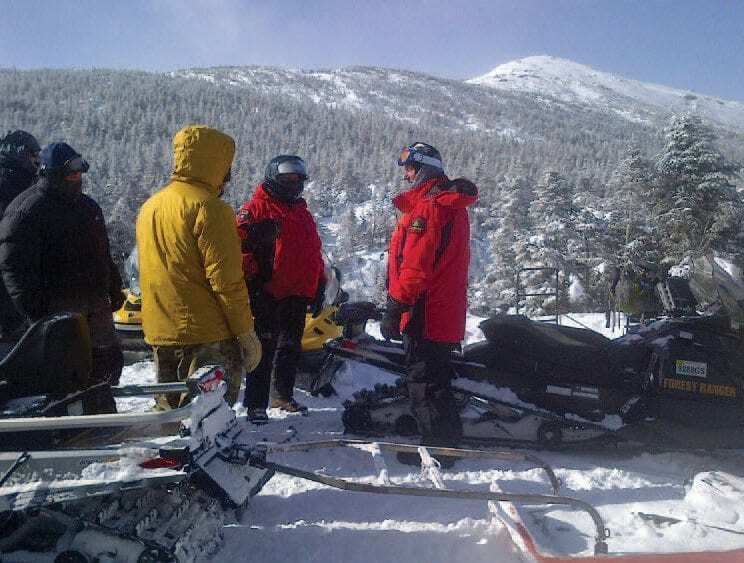 Meanwhile, Forest Ranger Scott Van Laer, who had been on patrol all day, skied from the Lake Colden caretaker’s cabin up to Indian Falls to meet the snowmobiles on the Van Hoevenberg Trail. Dell Jeffrey started later from South Meadow Road and took a snowmobile to tree line by himself, meeting the rangers shortly after they arrived. Kostoss believes that’s the highest anyone has snowmobiled in the state. Now a group of five, the rangers hiked to the summit with headlamps, carrying thirty-five-pound packs. Praczkajlo planted about a dozen flagged stakes in the snow so they wouldn’t get lost themselves. After reaching the summit, the men lined up to sweep the eastern slope back to the trail at tree line. The sweep included an area above Panther Gorge where several other hikers have become lost in the past, including Stephen Mastaitis, a fifty-eighty year-old attorney who spent a cold winter night on the mountain three years ago. Kostoss said the terrain and wind patterns sometimes push people toward the gorge. However, Cai was actually a little southwest of where the rangers started the sweep. “We were probably a tenth of a mile from her,” Kostoss said. Rangers had lost phone contact with her by this point. And despite the rangers’ proximity to the family on the summit, there was no chance of making voice contact. Winds were gusting up to forty miles an hour. It was so windy that the windshield of one of the snowmobiles blew away. At times, the men had trouble standing. The wind made the brutal cold even worse. It was about ten degrees below zero, and the wind chill made it feel twenty to thirty degrees colder. Kostoss, a sixteen-year veteran, said the conditions were as bad as he’s seen on Marcy. The rangers swept down the mountain in formation, keeping seventy-five to a hundred feet apart, just close enough that they could see each other’s headlamps. The going was slow, especially when the snow was deep and soft. Many times, rangers fell into spruce traps—holes around trees that were often five feet deep. The forest rangers were also equipped with transmitters that could pick up the lost party’s avalanche beacons. Several times they heard blips, perhaps from other electronic gear the rangers carried, but each time it turned out to be a false alarm. Around midnight they finally got back to the snowmobiles at tree line. By this time, they were weary from fighting the elements. One of the rangers had lost a snowshoe in a spruce trap. They realized they needed to get off the mountain. “We were kind of on the edge of being in trouble, and we knew that that’s all we could do that night,” Kostoss said. Leaving the mountain was a difficult call. Several of the men have children roughly the same age of the boys they hoped to save. They wanted to find them as soon as possible, because it was uncertain that the lost hikers could survive a night in such frigid cold. If they did survive, they might suffer serious cold-related injuries. “Everybody was quiet and didn’t want to talk about it,” Kostoss said of the decision to turn back. As these forest rangers descended the mountain, another team of rangers prepared to take over the search. 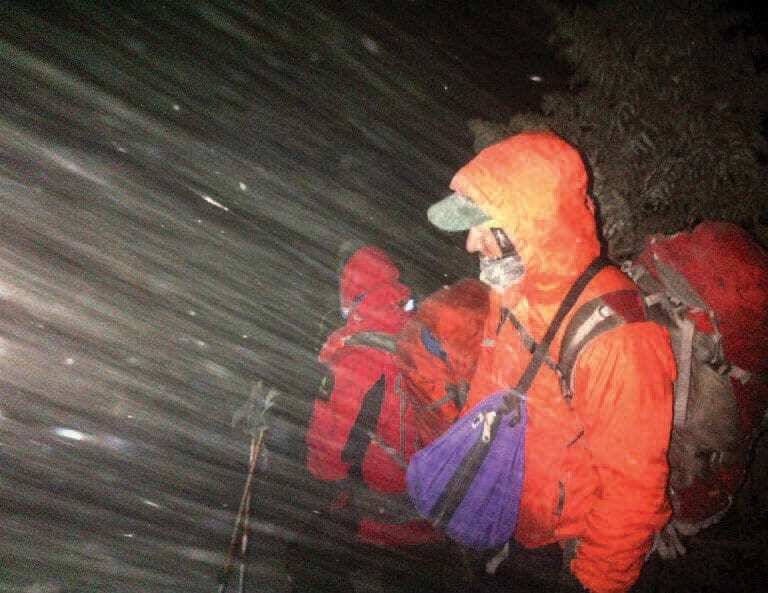 Leaving South Meadow Road at about 3:30 a.m., their goal was to get to the top of Marcy by daybreak and do a complete sweep of the summit. Later that morning, a third wave of rescuers ascended the mountain. By midmorning, there were seventeen searchers—forest rangers and state police—on the summit. 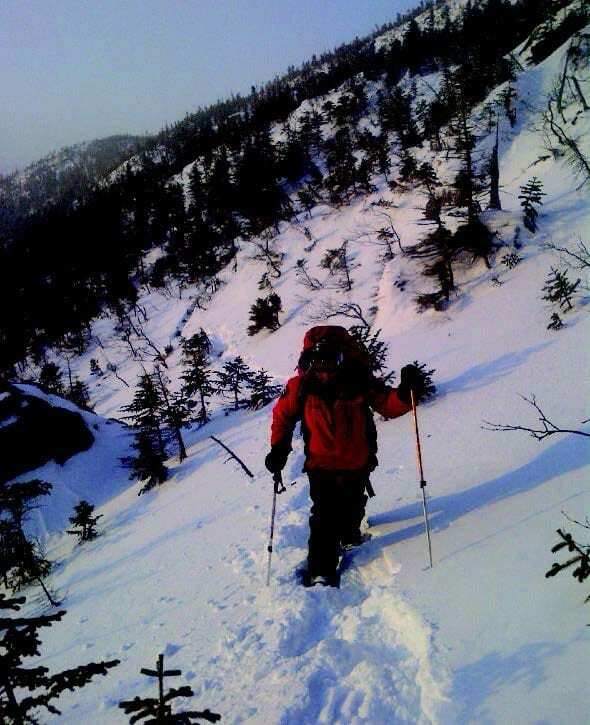 Ranger Kevin Burns trudges through snow on the second day of the search. Finally, at about 11 a.m., Sergeant John Haverly, the state police pilot, spotted the family from his helicopter. The three were a quarter-mile from the summit, perhaps fifteen minutes away from ground searchers headed their way. “We took one lap around [Marcy], and on the southwest side I see some woman waving her ski poles. I said, ‘I think that might be them.’ We circled around, confirmed it,” Haverly said. A forest ranger was lowered from the helicopter to the mother and her two sons, who had hunkered down in a snow hole to shelter themselves from the wind. The mother told rangers she had the boys do exercises during the night to keep warm. The ranger determined that they were all in fair condition, though with cold-related injuries. The boys were hoisted into the helicopter and transported to Adirondack Medical Center in Lake Placid around 12:15 p.m. Soon other forest rangers arrived and tended to the mother. In thirty-five minutes, the helicopter returned to take her to Adirondack Medical Center in Saranac Lake.